Ethiopia Gets Its 1st Female President Sahle-Work Zewde, an experienced diplomat, is the first female head of state in Ethiopia's modern history. Women also now constitute half of the country's Cabinet ministers. Sahle-Work Zewde walks with Prime Minister Abiy Ahmed after being appointed Ethiopia's first female president at the country's parliament in Addis Ababa on Thursday. Ethiopia's parliament has made Sahle-Work Zewde the country's first female president. And while the role is largely ceremonial, her appointment carries power in what it signifies. 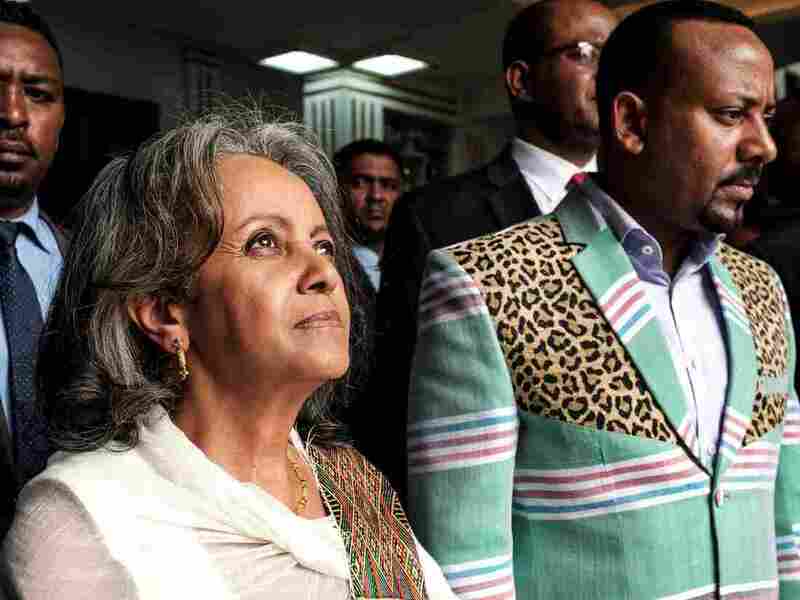 Sahle-Work, an experienced diplomat, is the first female head of state in Ethiopia's modern history. In June, U.N. Secretary-General António Guterres appointed Sahle-Work as special representative to the African Union and head of the U.N. Office to the African Union — the first woman in the role. She was previously director-general of the U.N. Office at Nairobi and held a range of diplomatic posts, including Ethiopia's ambassador to France and Djibouti. "A career diplomat & senior official at the UN, she brings the right competence & experience to the office," Fitsum Arega, chief of staff to the prime minister's office, tweeted on Thursday. "In a patriarchal society such as ours, the appointment of a female head of state not only sets the standard for the future but also normalises women as decision-makers in public life." In Ethiopia, the prime minister holds the executive power. According to the Ethiopian Constitution, presidential powers and functions include appointing ambassadors, receiving foreign envoys and granting pardons. Sahle-Work's appointment comes just a week after Prime Minister Abiy Ahmed overhauled the Cabinet. Abiy, who was appointed in April, reduced the size of the Cabinet to 20 from 28 — and then named women to half of the ministerial roles. Women now fill the two most prominent Cabinet positions: minister of defense and the newly created minister of peace, who oversees the intelligence and security forces. Metasebia Shewaye Yilma, a media entrepreneur and president of the Ethiopian women's business group AWiB, told NPR on Thursday that she is "ecstatic" at Sahle-Work's appointment, calling it "superb news for all us here, especially for women." She said the move was significant in numerous aspects. "One is women are represented in power," Metasebia says. "By her being the president, we feel like now the 50 percent of us is represented in that. "And the second thing is it will really change the narrative that you know women cannot hold political leadership positions or they cannot contribute much — you know, all those kinds of different narratives that there are now. They're now going to be changed." With women in power, she says, it will bring new qualities and leadership styles to Ethiopia's government and provide inspiration for the next generation of girls. Metasebia calls the political changes "a huge leap" in the generations-long struggle for gender equality in the country. "I would say now is a little late. Actually, it should have happened a long time ago, but the next best time is now." NPR East Africa correspondent Eyder Peralta contributed to this report.